For light office or personal use, the Toshiba e-Studio 150 is a compact desktop 3-in-1 that can provide monochrome printing, copying, and color scanning right out the box. The 30-sheet automatic document feeder is an optional feature that eliminates the need for a person to be present when scanning or printing multiple pages. The e-Studio 150 uses a stationary 8.5” x 14” platen for scanning instead of a sliding platform to keep its footprint no bigger than its physical size. The 35-pound e-Studio’s recessed output tray reduces the overall footprint of the multi-function down to only 20.5” x 18.5”. The control panel on the e-Studio 150 is straightforward, with indicators and keys for intuitive control and conditions of the copier. 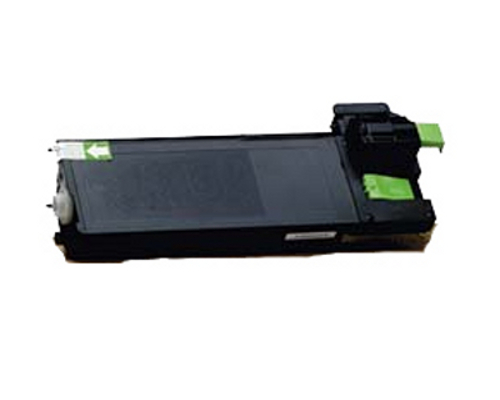 To isolate an error, locate an empty tray, or paper jam, the panel includes a diagram of the copier with LED indicators to indicate the area that requires attention. The Mode Select button allows for the e-Studio to be just as functional as a walk-up standalone machine, with copy, print and scan functions right on the control panel. Copying is as easy as placing the original in the feeder and pressing the “Copy” button. Resolutions of 600 x 600 dpi with settings to adjust exposure and contrast will print up to 99 monochrome copies at 15 pages per minute by storing the image in memory just once. Copies can be adjusted from 25% to 400% of the original in 1% increments or in 8 jumps. Copy quality can be set either manually, automatic adjustment of contrast, text or photo priority. The Toner Save feature is best used for draft copies and not for anything you want to distribute. The scanning feature has support for TWAIN, and Microsoft’s WIA protocols. While printing and copying is in monochrome, the e-Studio can scan in straight black-and-white, 256 grayscale or in color. Resolutions are enhanced up to 600 x 1,200 dpi. With the optional automatic document feeder, the e-Studio 150 can scan multiple single-sides pages automatically. 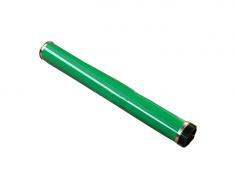 The e-Studio 150 can hold up to 250 sheets of letter-sized or legal-size paper. For even more printing/copying capacity, a second 250-sheet tray can be attached for supporting a ream of paper. The 50-sheet multi-purpose bypass tray on the side allows for of transparencies, envelopes, and labels. As a printer, the e-Studio 150 connects to your Wintel machine through either parallel or USB cable. Having a maximum resolution of 600 x 600 dpi and max speed of 12 ppm, the e-Studio prints decent monochrome text and graphics. The resolution isn’t the best for printing from detailed color originals. 8MB of memory enables the multifunction to handle all but the largest PDF text files and graphics and is sufficient for personal use. 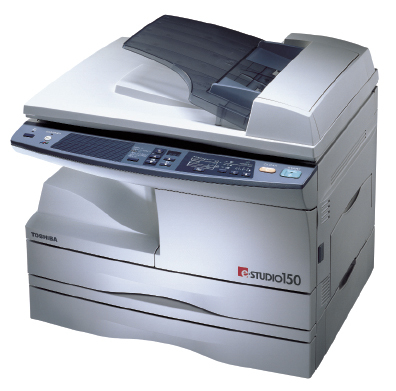 Compared to today’s copiers and printers, the 2002 e-Studio 150 shows its age with a 15 ppm copy, 12 ppm print speed, and a maximum resolution of only 600 x 600 dpi. As a printer, its monochrome print speed is slower than some of today’s single-pass color lasers, which offer faster speeds and higher resolutions. The 250-sheet paper tray while fine for personal use is woefully undersized for business use. It’s typical for even a small office to go through a ream of paper in a single day in copying, faxing, and printing. The second 250-sheet add-on tray would be a good investment for offices that go through a lot of paper in a typical day and are looking to buy this Toshiba. Software, printing, and computer scanning support are for Windows operating systems only. Basic printing functions are possible for Apple and Linux by using their own printing services and built-in printer drivers. Review it: "Toshiba e-Studio 150 "
Having the drum as a separate component reduces the overall consumables costs. The Toshiba toner cartridge will last for about 6,500 B&W pages (less if printing or copying graphics), and can be easily accessed by opening the front panel of the e-Studio.